La Scena Musicale: Austin Lyric Opera Goes Hollywood! Austin Lyric Opera may not be able to afford the most famous singers but it invariably provides first-class entertainment. 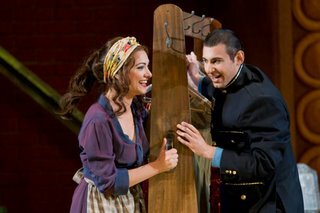 They’ve done it again with the current production of Rossini’s comic opera La Cenerentola which opened this past Saturday at the Long Center for the Performing Arts. Garnett Bruce is the stage director and he created this production for Lyric Opera of Kansas City in 2004. It moves the well-known Cinderella story from Italy to 1930s Hollywood and the world of movie-making. From beginning to end in this production we are immersed in the fantasy world of fame and fortune. The fairy tale search for a royal wife becomes a search for a new leading lady in this updated telling of the story. With surprisingly little doctoring of the libretto and none at all of the glorious music, Rossini’s classic romp comes to life once again, and I think the greatest operatic showman of them all would have loved it. The gist of the revised story line is acted out in mime while the orchestra plays the overture. Without any contrived additional dialogue we get the idea and the opera unfolds in pretty much its usual fashion. Musically, the production was well in hand with Robert Tweten wielding the baton. This young man has a remarkable flair for Rossini, invariably finding the right balance between singers and orchestra and capturing all the wit and sparkle in the score. He also had the courage and the skill to ‘press the pedal to the metal,’ as it were, with some blazing fast tempos. This fine cast and orchestra had apparently been rehearsed within an inch of their lives and in this opening night performance, they responded to Tweten’s beat with enthusiasm and musicality. But there can be no La Cenerentola without a great leading lady. The role of Cinderella requires a great comedienne and a mezzo-soprano with mastery of bel canto lyricism and virtuosity. 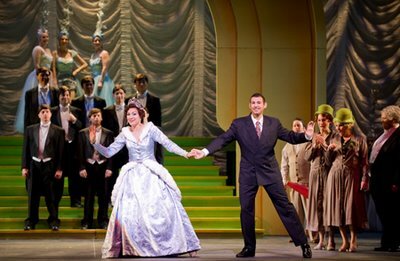 Sandra Piques Eddy may not have erased my personal memories of Cecilia Bartoli’s Cinderella in the near-legendary Houston Grand Opera production of a few years back; nevertheless, she was superb. Her voice is rich and full from top to bottom and she knocked off the technical stuff with almost effortless mastery. Her acting was somewhat less impressive. She handled the transformation from servant to star with conviction, but often seemed less involved than her colleagues. Perhaps director Garnett Bruce simply didn’t give her enough bits of business. Not that the production wasn’t ‘busy’ enough! Bruce’s direction created a convincing illusion that the backstage lot at “Palace Pictures” was teeming with a ‘cast of thousands,’ and each person who showed up on the ‘set’ came to life as a distinctive character. While the inclusion of a couple of Marx brothers was fun, however, Bruce might have worked a little harder to make them more like the people they were supposed to be. Harpo could have been busier annoying people or blowing his horn and Groucho could have at least walked like Groucho. In the dance rehearsal scene – choreographed a la Busby Berkeley - the costumes of the chorus-line girls were appropriately ‘over the top’ and the dancing of the male group was amusingly inept. Amongst the cast I would single out Cara Johnston and Liz Cass as Cinderella’s sisters, for both their vocal and histrionic efforts. They sang beautifully, their antics were hilarious, and their zany attire certainly added to the fun! Steven Condy as their father, Mr. Magnifico, practically cornered the market on the funny business in this production with endless mugging and all sorts of physical comedy. Tenor Michele Angelini as film director Don Ramiro looked every inch a 1930s Hollywood star with enough grease on his hair to lubricate a fleet of eighteen-wheelers. He was light on his feet too, sang with control, and his exposed top notes were generally ‘spot-on.’ John Boehr as Dandini – Ramiro’s chauffeur in this version – was funny and appealing and Kristopher Irmiter as the film producer Alidoro looked the part and sang with authority. General Director Kevin Patterson never forgets that he is in the entertainment business; his Austin-oriented Die Fledermaus from last season was a great triumph and this fresh and funny version of La Cenerentola was not far behind.